With the euthanasia of two more elders from the wild horse bands that formerly inhabited Nevada's Calico Mountain Complex, it is becoming increasingly difficult not to conclude that the BLM has a calculated plan to break down the hierarchy of familial groups by eliminating their most senior members. Within the last 48 hours, a 20-year-old "poor conditioned" mare was euthanized because of purported hyperlipemia and metabolic failure, the diagnosis du jour for most of the horses who have been put down. We don't know if she was in foal, or whether she had a foal by her side. We never do. And just today, a 25-year-old stallion was euthanized due to "poor condition" as a result of "tooth loss." Wow, that is so sad. 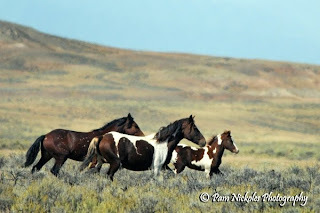 My heart goes out to the Wild horse band. There is "natural selection" and no need to euthanize before it is that horse's time. Thank for for your post.